Food, passed down from generation to generation, is a key piece of any culture. Especially in the face of persecution, one of the ways people maintain their cultural identities is by cooking family recipes and teaching them to their children. This is the case with Miami’s Cuban community. As early as the 1960s, Cubans have sought political asylum from Fidel Castro’s Communist dictatorship. Throughout the 1970s and 1980s, waves of Cuban immigrants made their way to Florida. The Cuban community began to grow as an increasing number of refugees became exiles from their country. Over time, South Florida has become a hotspot for Cuban culture, and as a result, tasty Cuban food. If you were invited to a Cuban friend’s house for lunch, chances are lechón asado, or grilled pork, would be on the menu. The tradition of pork as the main protein has endured throughout the years. If lechón asado is the meal of the day, arroz con frijoles, rice with black beans, will be your side dish. Cubans serve rice and beans with almost every meal. When the rice and beans are combined, they’re called congrí, also sometimes called Moros y Cristianos, meaning Moors and Christians. 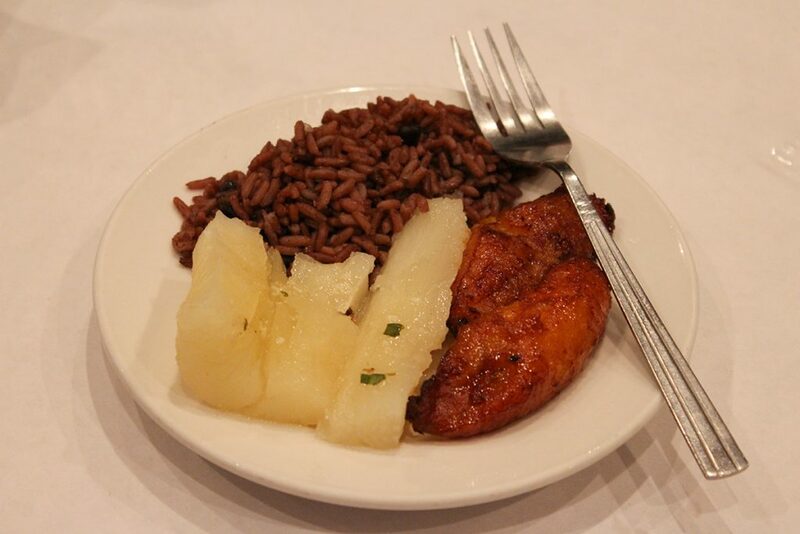 The rice represents the “Christians” while the beans represent the “Moors.” This dish is a nod to Cuba’s history, since many Cubans are of Spanish descent as Cuba was once one of Spain’s American colonies. The reference to the Moors refers to how, in the eighth century, Spain was conquered by African invaders, the Moors, and it stayed under Islamic rule for more than 800 years. Spanish Christians lived alongside the Moors, and hundreds of years later, this historical allusion takes the form of a tasty, classic side dish. No Cuban dish is complete without a side of maduros, or fried sweet plantains. Plantains, originally from India, were brought over by Spanish settlers to Cuba. They grew so well in the tropical region that they became an essential part of the Cuban diet. Plantains aren’t tasty in their raw form, though, so there are many ways to cook them. Maduros are made by frying the sweet plantain once. Tostones, another popular side dish, are made from the same sweet plantain, but are mashed up and fried twice. Maduros are such an essential part of Cuban culture that many families eat them every day. Cuban influence is visible on shelves in supermarkets across Miami. One of the most notable products is Materva, a mate-based soft drink. This was a popular Cuban soda that ended up immigrating to Miami after 1960. Any Cuban abuela would be appalled at the thought of there being no dessert after dinner. She’d make sure there was a sweet treat to top off a hearty meal, such as a flan, casquitos de guayaba (sweet guava slices) or famous Cuban buñuelos. While buñuelos are common throughout Latin America, the Cuban buñuelo is prepared differently. Instead of using dough, Cubans fry yuca, or yucca root, a Cuba-native plant that has been eaten long before the arrival of the Europeans. Cuban buñuelos are also drenched in almíbar, a syrup made from boiling sugar and anís, anise seed, to give the treat a distinct flavor. Even though Cuban immigrants arrived in an unfamiliar country with expectations to return home, they’ve created a thriving cultural community in Miami. The Magic City has become a hub where generations of Cuban descendants revel in their culture. When Fidel Castro’s death was announced Sunday morning, hundreds of Cubans took to the streets to celebrate, showing that Miami’s Cuban culture is alive and well. While the dictator’s death doesn’t mean Cuba will be ready to welcome its exiled generations just yet, it’s still a step toward progress for the Cuban people. Even after decades have passed, Cuban Americans continue to keep their Cuban culture close to their hearts, and they keep their rich, delicious foods and recipes on their plates.